Murder on the Santa Special by N. M. Scott, a Mysterious Review. Review: The village of Bramley is desperately seeking a solution to its financial woes. What they need are more people spending money in the local shops. "If we could just extend the line to Fenley we might attract more visitor numbers and generate more income," says Brigadier Eames, chairman of the village committee. But at £30,000 just to repair a bridge, that dream is far out of reach. Or maybe not. The old abandoned asylum site with its large home on extensive acreage has just been sold to a Russian billionaire, who wants to park his vintage train in the area, and seems to be willing to spend whatever it takes to make the village a home, his home, in Murder on the Santa Special, a traditional English country village whodunit by N. M. Scott. Until the necessary repairs can be completed, the village will have to contend with its annual holiday train rides to bring in money, and many of the residents are busy preparing for the festive event. All seems to going well; the Santa Special is fully booked, departing on time for the North Pole — actually, Badgers Halt dressed up for the occasion. But along the way one of the guests slumps over in his seat, dying later in the hospital. "A gentleman takes ill on board a train — that does not constitute a serious crime," a police officer tells Miss Parrish, who had questioned him about it. "I'm afraid I do not share your easy views," she replies. "I am of the strongest impression the gentleman may have been deliberately poisoned." 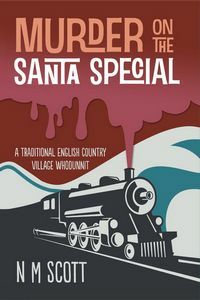 Murder on the Santa Special is a short mystery, a little over 120 pages, with the murder taking place at about the midway point. Part of the fun of village mysteries is trying to figure out who will be murdered; in this case, however, it is not one of the regular characters but an unknown. That doesn't lessen one's interest in the story, as it then becomes of a case of whodunit (and probably more importantly, whydunit). The fact that a Russian is the new owner of the asylum and that the dead man was also a foreigner would seem to link the two, but there is nothing officially suspicious about his death so there is nothing officially to link him to the Russian. The resolution comes about quickly (but not necessarily completely) and then the story turns to another potential murder, this one a cold case from the 1950s. This second mini-mystery isn't nearly as interesting (or entertaining), and almost seems unnecessary though it goes a long ways towards helping to establish a bond between Miss Parrish and the Russian billionaire, who together solve the old crime (or at least think they do). A quirky, fast-paced mystery written in brief chapters with a colorful cast of characters, Murder on the Santa Special is light, enjoyable reading. Acknowledgment: Book Guild provided a copy of Murder on the Santa Special for this review.